Through the U.S. Communities Government Purchasing Cooperative, Graybar helped the Raleigh Convention Center secure the right energy-saving fixtures for the center's exhibit hall. The 500,000 square-foot Raleigh Convention Center located in Raleigh, N.C., includes a soaring street-level lobby, an elegant ballroom and a massive exhibit hall. Completed in 2008, the facility averages between 250-350 events per year and more than 440,000 visitors. By using the U.S. Communities Government Purchasing Cooperative, Graybar helped the Raleigh Convention Center secure the right fixtures for the exhibit hall. According to their website, U.S. Communities is the leading national government purchasing cooperative, providing world class government procurement resources and solutions to local and state government agencies looking for the best overall supplier government pricing. The large, 150,000 square-foot exhibit hall contained approximately 160 sets of lights, with each set including one 750-watt HID and four 500-watt quartz fixtures. Graybar worked with several manufacturers to provide the convention center with a number of sample fixtures to install and evaluate based on functionality and appearance. 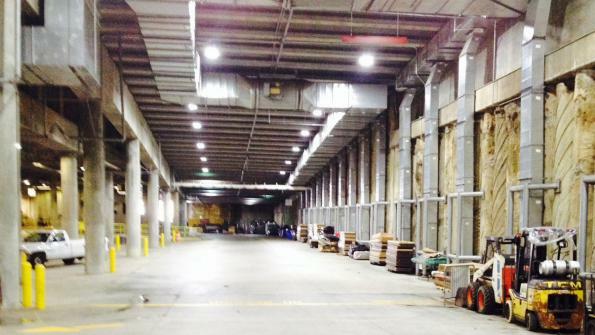 To replace the existing fixtures, Graybar proposed an LED combination that included 300-watt high bays and 85-watt cylinders, paired with Lutron dimming controls. With events being held year-round, shutting down the space to install the new fixtures was not an option. Instead, Graybar stored and received all fixtures at its local Raleigh branch, and worked closely with the installer to deliver the fixtures for quick installation between shows. Completed in October 2015, the convention center now has a modern and contemporary look. Plus, the lights turn on much quicker than before. “Overall, the look is much softer and the lights are not as harsh as before,” said Greene. In addition, the exhibit hall lighting upgrades have helped to significantly reduce energy usage and related maintenance by an estimated 318,230 watts per day. “Before the lighting retrofit we were changing around 170 bulbs a year,” said Greene. “Now, that number is down to zero.” Pleased with the results, the Raleigh Convention Center is currently working with Graybar to retrofit the lighting of its 45,000 square-foot ballroom, along with a number of other projects. Editor’s note: Content provided by U.S. Communities. Go here to view the full case study.